Aid workers are in a race against time to stop the rapid spread of disease as thousands of Rohingya people continue to arrive in Bangladesh every day. Oxfam warned that an outbreak of cholera would devastate the camps where hundreds of thousands of people are without safe water, shelter or enough food to eat. More than 50,000 newly-arrived Rohingya refugees have been hit by diarrhea, pneumonia, skin disease and acute malnutrition as aid agencies struggle to meet the needs of more than half a million people who have arrived from neighbouring Myanmar since August. Oxfam engineers are working through torrential rain and floods to install water pumps and tanks, latrines and emergency shelters and have so far provided help to 180,000 people in the over-crowded, ill-equipped camps and ad-hoc settlements of Cox's Bazaar. Safe water, food and clean toilets are critical to preventing the outbreak of cholera and many other illnesses that have already affected people living in the camps. Currently, the camps are short of 25,000 toilets, increasing the risk of disease. Enamul Huque, an Oxfam water and sanitation engineer who has worked for more than 25 years building water systems in the world's biggest refugees camps, including Zaatari, Bidi Bidi and Dadaab, says the crisis is one of the fastest population movements he has ever experienced. One woman who has recently arrived in the camp told Oxfam about her journey: “I came to Bangladesh about a month ago with my family. I walked for nine days to reach the camps. For three weeks I didn't have clean water or soap to have a shower or even to wash my hands. Yesterday, we got a toilet and a tub, and today we got soap and some food. I am happy, for the first time in weeks I can finally wash my clothes." The latest shipment of aid dispatched from Oxfam's warehouse in the UK has provided 15 tonnes of water pumps, water tanks and material for construction of emergency latrines to provide water to 35,000 more people. A further two shipments planned will help Oxfam to reach 200,000 more refugees. The total need for clean water each day is 58 million litres. The existing supply in and around the camps is providing less than a litre of water per person per day – insufficient to meet even their basic needs. In addition to providing clean, safe water and toilets, Oxfam and its partners have also been distributing emergency food materials including flattened rice, sugar and high-energy biscuits as well as providing hygiene materials like laundry and toilet soap to over 100,000 people. Oxfam is marking its 75th anniversary of mobilising against poverty and injustice – including a return to its Greek origins. Oxfam was set up as the Oxford Committee for Famine Relief on 5 October 1942, calling for the Allied blockade in World War II to be relaxed to allow vital food and aid to reach starving people in Greece and elsewhere in Europe. Since then, Oxfam has played its part in the successes achieved in international development, which have seen half a billion people lifted out of extreme poverty in the last two decades. In last year alone Oxfam helped more than 22 million people worldwide. Jim Clarken, Oxfam Ireland’s Chief Executive, said: “Since being established 75 years ago, Oxfam has grown into a global confederation of 20 affiliates, working in over 90 countries across the world to end poverty and suffering. It has been a remarkable three quarters of a century’s worth of work, providing practical, innovative ways for people to lift themselves out of poverty and thrive. “Of course, there have been considerable challenges during that time, due to conflict, violence and natural disaster – challenges which remain to this day. We have responded to numerous humanitarian crises such as famines in East Africa, conflict in Kampuchea, Darfur and Democratic Republic of Congo, the Asian tsunami and recent earthquakes in Haiti and Nepal – to name but a few. “As well as our emergency responses and long-term development work, we have campaigned to tackle the roots causes of poverty, inequality and injustice, so that the voices of the poor influence the local and global decisions that affect them. "Sadly Oxfam’s history has come full circle and we are working once again where it all began – in Greece, where thousands of families fleeing violence, persecution and poverty are currently stuck in limbo in makeshift tents. Since October 2015, Oxfam has helped over 100,000 people forced to flee their homes with clean water, sanitation, shelter, food, hygiene kits, and safe spaces for vulnerable women and children. “Just last week we continued our Greek connection by launching the Museum Without a Home exhibition at the Ulster University in Belfast. The exhibition showcased real items donated by the Greek people to refugees arriving there, demonstrating their solidarity with vulnerable people fleeing their homes in search of safety and dignity. Oxfam can trace its history in Ireland back to the mid-1950s, with one of the earliest records being an article in the Belfast Telegraph about clothing collections for “famine relief” from May 30th, 1957. In the 1960s support for Oxfam really started to grow across the island of Ireland, especially with the introduction of a chain of shops. Then in 1998 Oxfam Ireland became an independent organisation, affiliated within the wider confederation of Oxfam International. Clarken added: “Oxfam has been supported by people across the island of Ireland for over 60 years, and people here have made invaluable contributions to our work worldwide, playing a significant role in making Oxfam what it is today. Whether it is by volunteering, donating stock or shopping with us in one of our shops; by signing one of our petitions calling for changes in the rules that keep people poor; helping a street collection for our East Africa famine response; or by undertaking a community event such as the Trailtrekker challenge or organising an Oxjam music event as a fundraiser – our supporters throughout Ireland have helped deliver real change to the lives of people affected by poverty. We need your help now more than ever. Oxfam is urgently appealing for people to donate to its Saving Lives fund to support those suffering across the world. Let’s bring hope to even more people. Please give what you can today. More than 70 per cent of the nearly 480,000 Rohingya refugees who have fled to Bangladesh are without adequate shelter and half have no safe drinking water, Oxfam warned today. Heavy rains and floods in camps have left people facing extreme hardships, and have slowed down the building of emergency shelters, clean water tanks, and the delivery of aid. Paolo Lubrano, Oxfam Bangladesh’s Humanitarian Co-ordinator, said: “It is truly terrible to see the level of need there is among people here. People are living in make shift tents under heavy rains. Tens of thousands don’t have food or clean water. If they are very lucky they have some plastic sheeting to take shelter under – but most of the time families are huddled under sarongs. These people urgently need help. “Most camps are flooded, including Katupalong and Balukhali where Oxfam works. For people forced to flee this is absolutely devastating – they have crossed one torrential river, just to be confronted by insecurity and pouring rain. A humanitarian flight carrying 15 tons of supplies left Oxfam’s warehouse on Friday. Materials include water pumps, material for construction of emergency latrines and water tanks. Two more humanitarian flights are planned with additional supplies. Since August 25, nearly 480,000 Rohingya people have crossed over to Bangladesh’s South-Eastern districts resulting in a massive humanitarian crisis. Of these it is estimated that over 340,000 have inadequate shelter and about 240,000 have no clean water. Oxfam’s response has reached nearly 100,000 people with clean drinking water, emergency toilets, water pumps and food rations. Oxfam is planning to help more than 200,000 people during the first phase of its response. Oxfam is also supporting the government and humanitarian partners to ensure camps newly established will meet the necessary humanitarian standards. Due to the volatile and chaotic situation, Oxfam is concerned about abuse and exploitation of women and girls. Privacy, health, and hygiene for women, girls and nursing mothers are compromised, and measures must be taken to prevent any form of sexual violence. This year has been one of unprecedented disasters. From drought to famine, hurricanes to war, the global news cycle has been dominated by heart-breaking stories of people caught up in unimaginable situations. But in the midst of all this, our life-saving and life-changing work is providing hope thanks to the ongoing generosity of our supporters and the Irish government. Right now, we’re providing clean water, sanitation and shelter to thousands of Rohingya people who have fled to Bangladesh. Over 400,000 people have crossed the border from Myanmar in the last four weeks, doubling the number of people seeking refuge in the south east of the country. Homeless and hungry, people are arriving physically and emotionally traumatised, in desperate need of essentials like water and food and a place to lay their heads. Women, children, older people and those with disabilities are especially vulnerable. And the situation is even more desperate due to recent heavy rains in Bangladesh, with some of the settlements on hillsides and roads at risk from mudslides. (Top) Dilenia Florimón together with her daughter in the middle of what remained of her house, two days after Hurricane Irma struck the community of Boba in the province of María Trinidad Sánchez, Dominican Republic. Photo: Fran Afonso / Oxfam. (Bottom-left) Litter along the beach of Corniers Plage near Cap Haitien, the morning after Hurricane Irma hit. Photo: Jean Bernard Simmonet. (Bottom-right) A powerful wave crashes into the already-flooded Vevado district of Havana during Hurricane Irma. Photo: Erislandys Igarza / Oxfam. 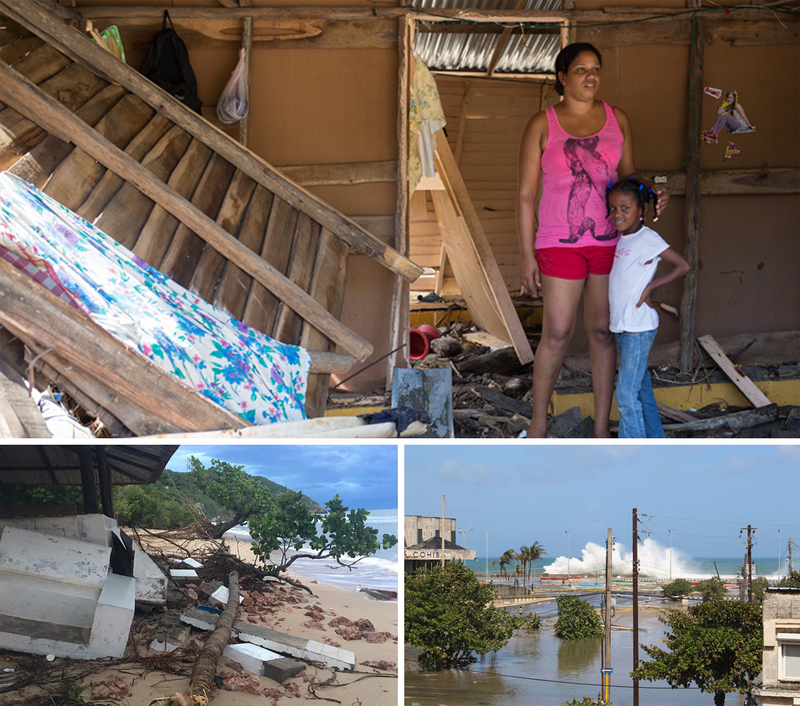 Elsewhere, in the Caribbean, the clean-up after Hurricane Irma – one of the most powerful storms in a decade – was hampered by the onslaught of Hurricane Maria, which followed when many of the islands were still reeling from Irma. The devastation wreaked by Irma claimed the lives of 38 people across the Caribbean islands, with ten deaths in Cuba alone. The islands’ tourism, energy and agricultural sectors have been severely impacted, with the northern coast and the eastern and central regions bearing the brunt. In all, around two million Cubans had to leave their homes and 50,000 seek refuge at evacuation centres. Many people, whose livelihoods have been disrupted, have since returned to their homes to find them destroyed. Haiti and the Dominican Republic, where Oxfam is on the ground, were also badly hit by flooding and high winds. Tragically, this appalling humanitarian disaster was quickly followed by another when a 7.1-magnitude earthquake struck Mexico City and the neighbouring state of Morelos. This was the second earthquake to hit the country in less than two weeks. Over 230 men, women and children have been killed, hundreds more have been injured and buildings, including hospitals and schools, have been reduced to rubble. (Left) Mother-of-four Tahrir (25) holds her baby in Padding, in Jonglei, South Sudan. Tahrir, who lives with her husband, mother-in-law and children, used to have a farm and cattle. Then the war started and her cows were stolen. She says: “I can’t buy food. Now we survive on what we find in the wild.” Photo: Albert González Farran/Oxfam. (Right) These mothers and children are part of a large group of refugees who fled violence in their villages in recent months. More than 2.6 million people in Nigeria, including 1.5 million children, fled their homes for safety. Now they find themselves facing new dangers such as hunger and malnutrition. Photo: Pablo Tosco/Oxfam. These terrible crises are quite rightly dominating the headlines. However, a disaster of epic proportions continues to unfold in the background. Across northeast Nigeria, Somalia, South Sudan and Yemen, 30 million people are facing starvation. The primary driver of these hunger crises is conflict, although in Somalia it is drought. In February, famine was declared in South Sudan and while it has since been halted, people are still living on the brink. So far 2017 has brought terrible pain to many people. But we are there to help in this time of need. Oxfam is on the ground in all of the countries mentioned above as well as in countless more. When emergency strikes, we’re there, assessing the damage and providing what’s needed most. Whether it’s clean water and toilets to prevent the spread of deadly diseases or other essentials like food, shelter or information, we make sure people hit by disaster are safe, protected and have dignity. We couldn’t do this without you and we need your help now more than ever. Let’s bring hope to even more people. Oxfam is now providing clean water, sanitation and tarpaulins for shelter to Rohingya people who have fled to Bangladesh. Nearly 370,000 people crossed into Bangladesh in the last four weeks, doubling the number of people seeking refuge in the south east of the country. The existing camps in Bangladesh are ill-equipped to handle the huge numbers of people. People need shelter, clean water, toilets and food urgently. Women, children, older people and those with disabilities are especially vulnerable. Oxfam’s initially plans to help 200,000 people. M B Akhter, Interim Country Director, Oxfam in Bangladesh, said: “People face a desperate situation. They have no clean drinking water and no food. They are homeless and hungry following a long and treacherous journey across the border. Many are now sleeping under open skies, by roadsides and in forests, with no protection. Bangladesh has hosted 400,000 Rohingyas since the 1990s. The continuing influx has doubled the number of refugees in the South-Eastern Districts of Cox's Bazar and Bandarban districts.